From trapline to showroom, an industry that birthed a nation sees a resurgence. As published by Al Jazeera America, February 28, 2015. THUNDER BAY, Ontario — The land dwarfs Mark Deans as he stands in the center of a frozen lake, gloves on his hands, a beaver hat on his head. While the bulk of his salary comes from his work at a northern gold mine, Deans and his family supplement their income through trapping. For the last 10 years, they have run a registered trapline in the wilds of northern Ontario, Canada. To many, the trade is a wistful, often nostalgic idea, occupying the iconography of the past alongside birchbark canoes and trading posts. There is perhaps no industry as wedded to the Canadian narrative of national identity as fur. After all, it was hundreds of years ago, in 1670, that the British crown chartered the Hudson’s Bay Company (HBC) as a way of expanding further into what is now Canada, hot in pursuit of the rich, abundant fur pelts. Three hundred and forty-five years later, both HBC and the trade still exist, albeit in different forms. In 2013, Industry Canada valued the export of fur at more than $950 million (all dollar figures are in U.S. currency). While the majority of this fur is farmed, a shift in the markets has buoyed demand for Canadian wild fur, the country’s founding industry. The main players have changed, but a relentless appetite for furs still remains. “I’ve always had a strong connection to the outdoors. Trapping was another reason to be out there,” says Deans. Much of his life and career has been spent in the boreal forest. During his university years, he studied resource management, and he later worked in the forestry industry before making the move to mining. Over the years, he has been drawn to jobs that helped maintain and strengthen his close connection to nature. 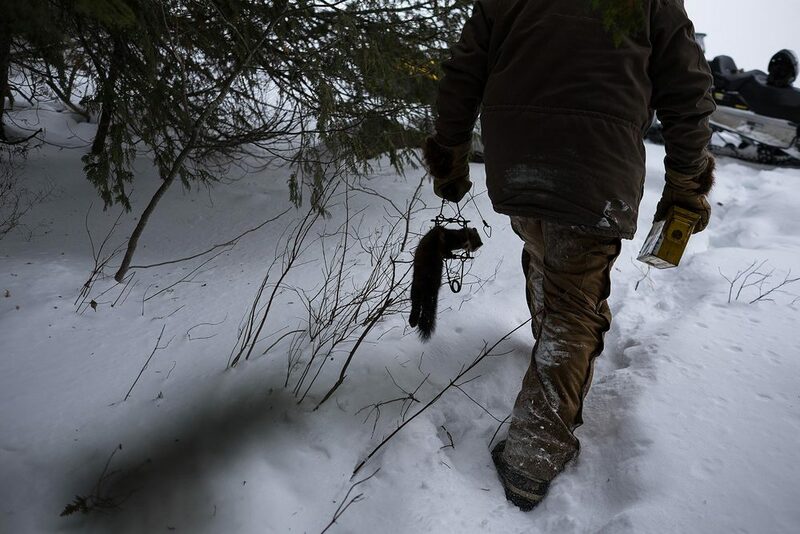 The modern Canadian system of trapping utilizes a system of registered traplines, which are designated land claims allocated by the government allowing a trapper the right to occupy (but not own) government land with the purpose of trapping fur-bearing mammals. To ensure the land is used accordingly, trappers must produce a minimum number of furs per year, depending on geographic region and species. A 200-square-foot trapline cabin can be built, but the trapper does not own the land under it. The trapline system has been in effect throughout Canada since the early 1930s, although each province is given control over management. While not every province uses the system, between British Columbia and Ontario, there are 5,700 registered traplines. The scope of Deans’ trapline crosses through 54,000 acres of forest, interrupted only by lakes, swamps and rivers. The 86 traps he currently maintains are primarily set for marten, fisher, mink, beaver, lynx and river otter. But, he is quick to point out, traps carry no guarantees of a successful catch. “The wolves are my biggest adversary,” he jokes, readjusting snares after a pack bypassed his traps to steal the bait left under a tree. Indeed, relief at the sight of a trapped marten signifies the difficulties involved in the trade. Monitoring his diffuse traplines means braving the bitter cold, which can dip below -40 Celsius, and crossing potentially treacherous sections of frozen lake via snowmobile. A disappointing string of checks on one day shows the difficulty of the pursuit. “Either way, Mother Nature usually wins,” he says. Prior to the arrival of European colonizers, aboriginal groups trapped heavily in northern Ontario. With the region’s extensive river networks, the Europeans quickly saw waterways as a route toward more sources of fur. “All the so-called explorers of Canadian history are really just fur traders. And they’re all just trying to find new and better routes,” says Dr. Sylvia van Kirk. Her book “Many Tender Ties” examines the social relations between Europeans and aboriginals resulting from the fur trade. With a huge demand for beaver pelts in Europe, a frenzy of trading, combined with colonial ambition, set the tone of the British and French presence in North America. “What is now western Canada was initially developed under the umbrella of the fur trade companies,’’ she says, citing Edmonton, Winnipeg and Victoria as cities that began as fur trade posts. The trade no longer has the same degree of political urgency, although nation building is surely a tough act to follow. Data collected by the Fur Council of Canada suggest there are 60,000 active trappers across Canada. But while they may not see a massive windfall from the trade, the monetary stakes in the auction process highlight the huge demand for furs. A 150,000-square-foot warehouse facility near the Toronto airport houses the headquarters of North America Fur Auctions (NAFA). It is the largest farmed-fur auction in North America, but also the most extensive wild-fur auction in the world. Formed after the divestment of Hudson’s Bay Fur Sales, the auction house traces its founding to the same year the HBC was chartered. Held three times per year, the auction attracts international buyers from China, Russia and continental Europe. Prior to the auction itself, buyers descend on the warehouse to inspect the lots. In 2004, a combination of wild and farmed fur contributed $295 million to exports. By 2012, the value had jumped to $707 million. In 2013, average pelt prices were highest, bringing the value of fur exports to $956 million, more than $100 million of which was wild fur. While the markets have cooled off slightly, the volume of pelts sold steadily increases each year. For example, the average marten pelt will bring in between $70 and $100, although Deans proudly points to a letter on his garage wall from NAFA, certifying that a pelt he sent in 2013 was given one of the highest grades and sold for $182, during a sharp uptick in prices. While there is clear demand, and prices have rebounded from the lows of the 1990s, it is still difficult to capture the scope of the wild trade. Canada stopped compiling data about nationwide fur harvests in 2010, the same year that many census efforts were stopped as part of budget cuts. Much of what drives this resurgence in the trade is the appetite for furs in China and Russia. As the Chinese economy produces a new generation of affluent consumers, furs continue to maintain the allure of luxury. A string of cold winters in parts of China has also helped inflate prices and spur demand. “If you look at the whole northern part of China, it’s cold. When we think of China, we don’t think of it as a cold nation, but it has large parts of it that are cold. And whenever you see it becoming cold, that’s where you see fur,” says Herman Jansen, a founding member of NAFA and later its CEO and managing director. While markets are expected to stabilize, the collapse of the Russian ruble has also affected fur prices. In NAFA’s Blue Room, named for the curtained area adjacent to the warehouse, prospective buyers watch the auction projected onto a screen and mill around food tables. Decorative red paper lanterns hanging from the ceiling denote the strong Chinese presence driving the fur markets. In 2013, Industry Canada’s data showed 72 percent of all fur was shipped to either Hong Kong or China. “It’s absolutely incredible how much power they have in the market,” says Jansen. Before sales begin, there is a rigorous inspection process that takes weeks for the hundreds of thousands of pelts. Graders scrutinize the furs, fingers running over the long, coarse outer guard hairs, searching for the slightest flaws. The pelts are then tossed onto different piles, depending on the grade: gold, silver or bronze. The process takes less than 30 seconds for a seasoned grader. They can identify, through fur color, not only the geographic origin of the animal, but also the season in which it was born. Minor nicks, the result of inexperience or haste during the skinning and preparation phase, can significantly erode a pelt’s value. Every pelt is graded for quality and bar-coded, not only enabling record keeping, but also allowing trappers to digitally track the sales. For the four-day auction, beginning on Jan. 26, more than 325,000 wild fur pelts, consisting of marten, coyote, beaver and lynx, are sold. As is the case with most commodities, the auction itself is a frenzy of shouts, raised arms and the sound of a gavel closing the sale. Because of the vocal strain of leading the bidding, NAFA rotates its auctioneers after only an hour stint. The rapid price calls and bids are streamed to buyers abroad, as well as those in the adjacent Blue Room. “We’ve changed from a traditional European business to a China trade,” says Jansen, who has worked over the years as an auctioneer. Near the end of the 1980s, the fur industry watched as a commodity crash quickly eroded the value of pelts on world markets. At the same time, animal welfare movements, led by PETA and the Humane Society, also hit the industry with well-funded campaigns. The vagaries of fashion turned designers away from fur, obscuring it from public view. “Fur has been out of fashion for a good 20 years. By the ’90s, fur was dead. It was the cycle of fashion. Now we’re at the point where it’s spinning back up. Fur is here,” says Farley Chatto, a Canadian designer who has used fur in his designs for the last 26 years. He now works with Four Seasons Fur in Toronto. It is one of the largest Canadian fur manufacturers, selling to a wide range of clients, including the rapper Drake. Regardless, Canada Goose, the maker of a function-turned-fashion parka, has seen sales explode 4,000 percent over the last decade, and they continue to grow in the double digits each year. The company has also announced the opening of a second production facility in Toronto. As it expands rapidly to feed a growing appetite in the United States and Asia, it must increase its purchases of fur. Prices for coyote pelts this year were 50 percent higher than at the last auction, in late spring of 2014. Despite the presence of Canadian buyers at the auctions, Rob Cahill, senior vice president of marketing at NAFA, says that at least 90 percent of the coyote pelts sold are to Chinese buyers. This is a sharp uptick from their 70 percent market share only two years ago. For buyers in overseas markets, primarily Chinese and Russian, the imagery of fur used for promotional purposes continues to affirm the idea of luxury and status. “When we fell out of favor, the Chinese market was the new emerging market, as well as the Russian market. They love their furs,” says Chatto. Domestically, however, the message is repackaged. The industry now markets its products to a new generation in the language of sustainability and environmentally friendly buzzwords that often influences purchasing decisions. The industry promotes a Fur Is Green website devoted to various environmental claims, namely the ecological benefits of wildlife management and trade. It also strikes back at synthetic materials. Made from oil, materials like synthetic furs and water-resistant fabrics come with their own ecological footprint. Designers have also been drawn to fur for its reusable qualities. Unlike other materials, fur can be pulled apart and reassembled in a way that may look nothing like the original coat. The changes to the industry over the last 20 years have been more than cosmetic, at least in Canada. In 1999 Canada joined Russia and the European Union to become a signatory to the Agreement on International Humane Trapping Standards. These guidelines set the standards for traps as a means of reducing the suffering of trapped animals. By 2007, all traps used in the country had to meet a standard set by the regulating body. The steel-jaw leg-hold trap, often the symbol of opposition to trapping, is banned in Canada. While modified versions of the leg-hold trap still exist, some trappers, like Deans, use kill traps to minimize the suffering of animals. Despite the industry’s sustained public relations campaign and the changes to trapping standards, fur remains controversial in the public eye. Much of what the public sees, according to Deans and Cahill, is outdated information. Because the provincial governments regulate trapping, there is a close relationship between trappers, ministry officials and researchers. “We’re the eyes and ears of the forest, since we’re out here so often,” says Deans. While national counts are no longer performed, each year trappers are required to report their catches to provincial authorities to help monitor population strengths. “Wildlife is managed in every country in the world. In Canada and the United States, in addition to being managed, it’s also allowed and encouraged to be traded, ” says Cahill. Despite the arguments for wildlife management, Liz White remains unconvinced. “The argument about managing the populations is frankly just nonsense. Most of the trappers and most of the departments of natural resources have no idea how many animals there are. They have no idea what the numbers are.” She contends that while trappers like Mark Deans may be required to file numbers each year, the lack of peer-reviewed scientific study undermines the efficacy of wildlife management. While Ontario’s Ministry of Natural Resources confirms that it monitors the number of pelts taken in, it doesn’t give any indication how overall population numbers are observed.